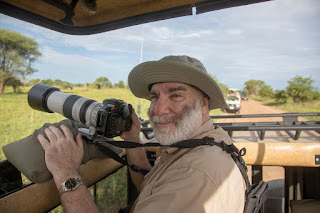 (((AZURE))): Charl went on safari! I knew that my brother Charlie went to Tanzania, Africa but I didn't know he went on safari. Here he is with a safari shirt and everything. Having a dang good time. I'll try to feature some of his great animal pictures. This trip assuredly was a photography trip. I have a friend who went on a safari and she said the first time you see animals, it is SO exciting. And the second time, it's STILL SO exciting. And so on. My brother, sister and I (with Dennis) are planning a 4 day vacation this summer in San Juan Island. We've all been wanting to take a float plane so now we're going to do it. Going to rent a house for 3 nights and generally see the sights.